Shoreham historian Henry Cheal tells us that following the great storm of 1703 that blew down the town’s original market house another was built in its stead in 1711 on 10 columns and stood opposite the Crown and Anchor pub.The new market house was described as having consisted of ‘an oblong canopy of freestone (a fine grained stone, usually sandstone or limestone) embellished with gothic ornaments, supported by ten columns’ and was ‘a fine piece of architecture.’ Was it merely a canopy or roof supported on columns – maybe not as Cheal refers to the new building as a market house? It was itself later removed and replaced by another market house contemptuously described as ‘a mean building of brick,’ in East Street near the New Road junction in 1823. From there we are told it was taken to the island at the bottom of Southdown Road where it would have been a landmark seen by the crowds on their way from the station to the popular Swiss Gardens. Another Shoreham historian Michael Norman though believed that the 1711 replacement building paid for by a borough member was ‘a small classical tempietto’(a circular gazebo-like structure) on ten tuscan columns that was moved in 1823 to a position opposite today’s war memorial in East Street then later to Southdown Road. 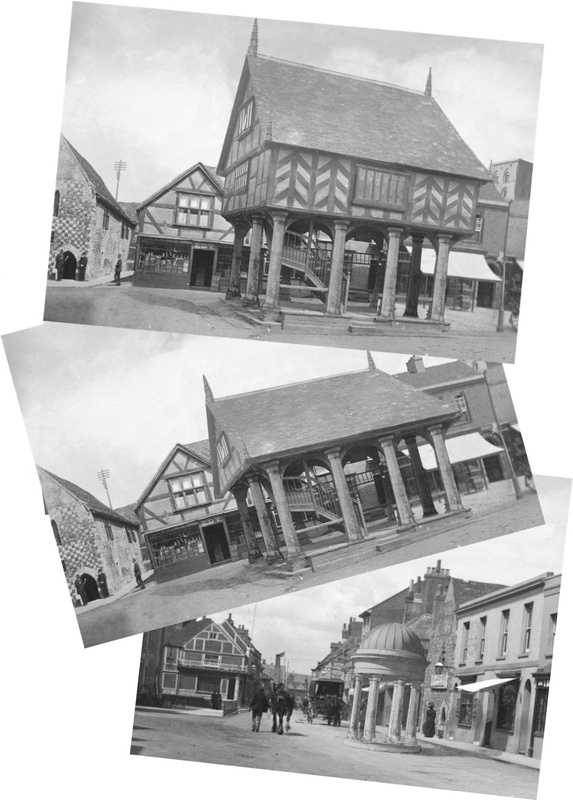 The 1711 building – market house, canopy or tempietto? Who was right, Cheal or Norman? To take down and re-erect a brick building (no matter how mean) requires a fair amount of labour and expense so it would seem more likely that, being more easily moved, a small tempietto was involved. 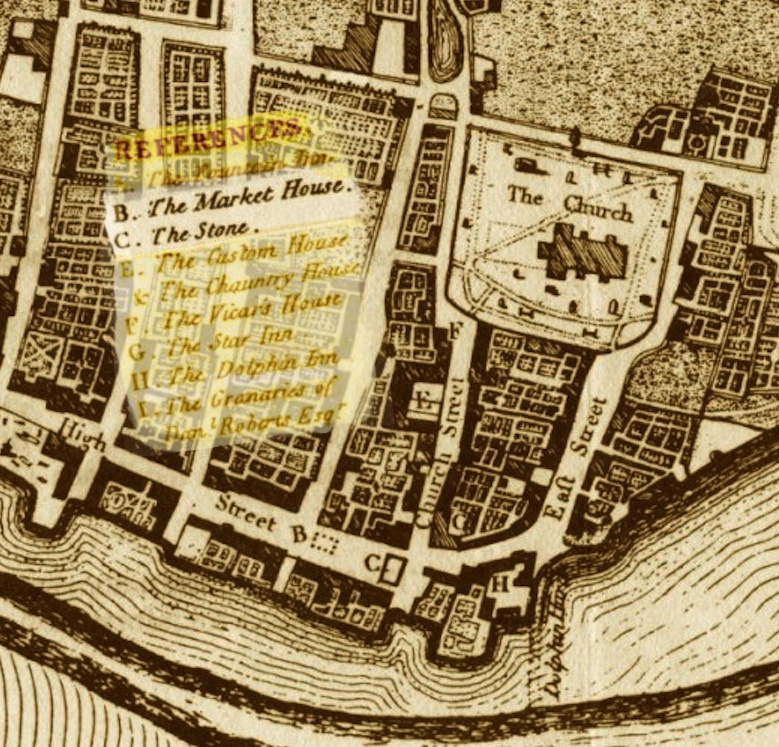 However, the footprint of the market house in the High Street on the 1782 and 1789 maps clearly shows an oblong shape marked out by ten dots to indicate each of the pillars. 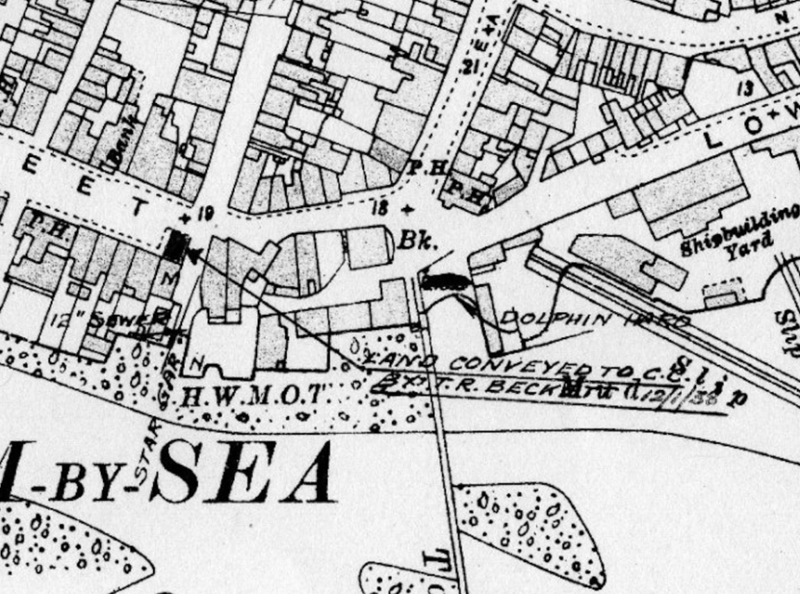 The footprints of the most likely candidates for the buildings subsequently built/re-erected in East Street in 1828 and 1844 in Southdown Road are also oblong shaped (the latter although not conclusively so) but no circular footprints at all. We are therefore left with the columns as the only photographic record of the market house or tempietto for those of them that survived into the 20th century as lamp posts. 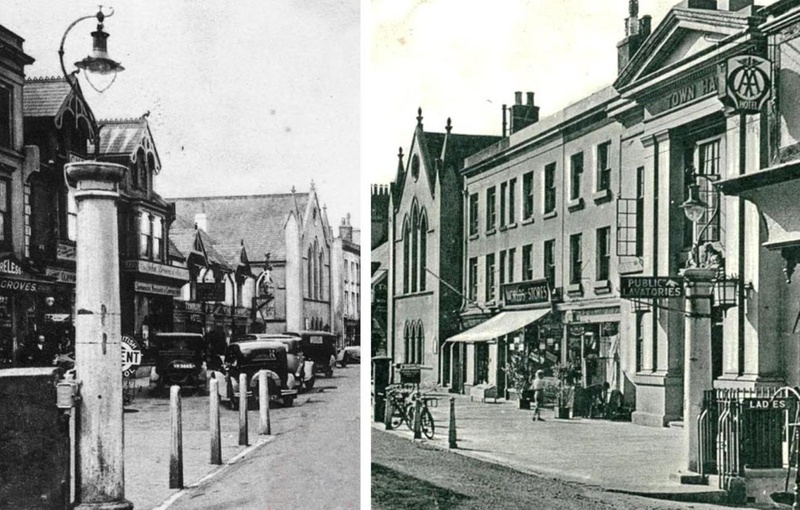 The two best known were sited at the east and west ends of the old market place. However, a further four tuscan style columns have now come to light that appear to once have been on the western side entrance of the old Town Hall. These were not included when the Town Hall was originally built (as the town’s Customs House) and surely as a subsequent addition would have been an otherwise expensive and unnecessary embellishment for just a side entrance unless they were already freely available such as the old market house posts. The columns in the photo were in front of steps up into the side entrance so the figures on the steps behind them may make the posts appear shorter. Another doubt may be that the collar rings on these four are more wide apart than the two in the High Street but perhaps the corner posts on the market house for example were slightly different from the other six? It is well known that the stone that once lay at the eastern end of the High Street in front of Stone House was traditionally used to announce to the townsfolk the newly elected members of parliament for Shoreham Borough. Once again though there seems to be some discrepancy between Henry Cheal and Michael Norman’s descriptions. Cheal refers to them in the singular and the stone as such is clearly marked on the 18th and early 19th century town maps as one large stone covering most of the width of the High Street. Norman though mentions them as stones and specifically describes them as one large and one small flagstone set into the road cobbles with the elected MP’s standing on the large stone and the Returning Officer on the small one. Reg Leggett, a long standing 20th century crusader for the preservation of Shoreham’s architectural history also distinctly recalled ‘two Parliamentary Stones let into the pavement.’ Cheal though does later include Arthur Packham’s drawing of two stones in front of Stone House and a single, complete stone of the huge size indicated by the maps does seem improbable. Perhaps they simply showed the general area where people gathered. 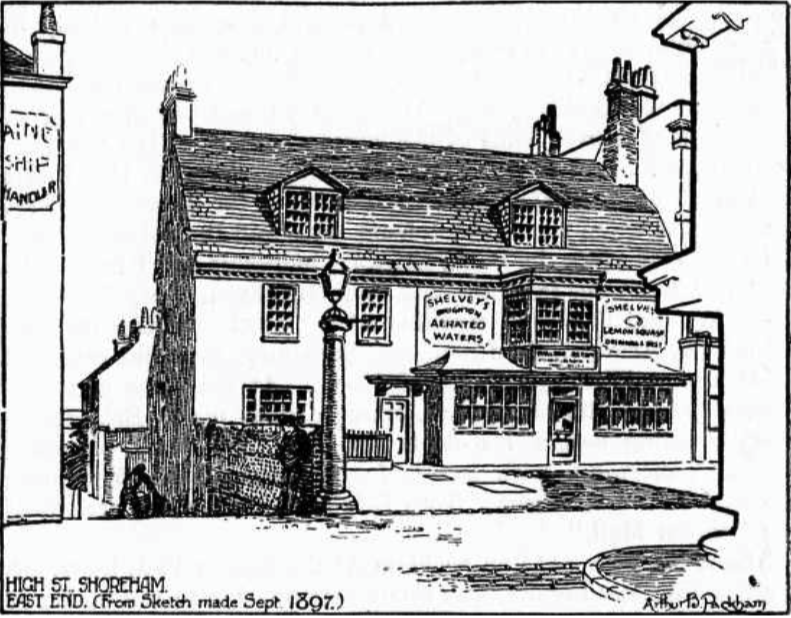 No photographic evidence can be traced of the stones and the only known image of the location is Arthur Packham’s 1897 drawing showing them in front of Stone House – the drawing itself a copy of an earlier drawing. The programme for Shoreham’s 1923 regatta and carnival mentions ‘dancing on the stones’ as part of the evening’s entertainment. It is very tempting to imagine that townsfolk still recognised the stones as part of their history and had their dancing there but a report of the 1921 regatta reveals that after the day’s events the dancing was held ‘on the stone flags outside the Town Hall’ – a wide area of various sized paving slabs that in those days lay halfway across today’s High Street. In the years since, traffic continued to build and at the narrow gaps at each end of the High Street pedestrian safety was often at risk when vehicles mounted the pavements as they passed other, oncoming traffic. Buildings were identified that would impede a widened highway and compulsory purchases arranged. I have a copy of the council’s town map that has an arrow pointing at the stone area with an ominous annotation that says “Land conveyed to C.C. (County Council) by T.R. Beckett 12/1/38” (1). Perhaps one of the privately owned parcels of land compulsorily purchased to enable many of the historic buildings on the south of the High Street to be swept away.